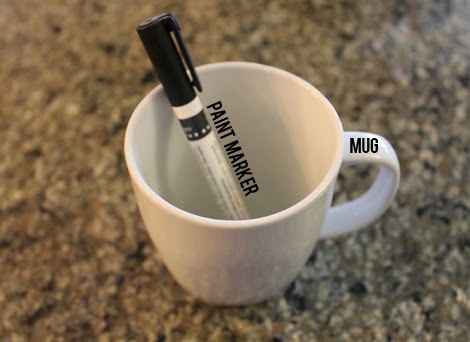 less is more: custom mugs, round II (ding, ding, ding). custom mugs, round II (ding, ding, ding). Christmas 2012 I made my ex-boyfriend custom mugs as a gift and wrote about them, then started up an Etsy shop to sell them to the world, which ultimately failed for a number of reasons, listed here. This Christmas though, my best friend asked me if I could make two for her to give as gifts to her roommate and her boyfriend, so I decided that maybe it would be fun to pick it up again for a minute. It was a success, but I'm going to take that success with a grain of salt because I definitely still don't have time for this type of endeavor with a full-time job that keeps me out of the house for 11 hours a day. 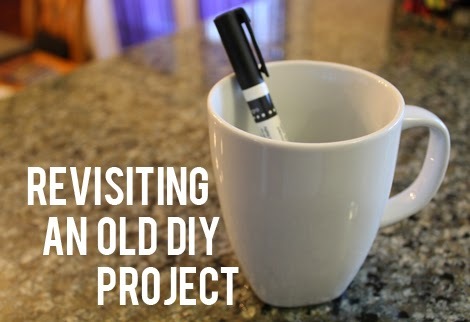 Even though in my post about not making these anymore I said that I would use different materials, I still had a black marker laying around, and I went back to IKEA because I did like the mugs that I used even though sometimes they were a bit finicky. My friend wanted me to do the scrabble design for the mugs, which was probably my favorite to do when I originally made these, and everything went well. I tried really hard to amp-up my technique by making sure the shadowed edges made sense (thank you sixth grade art for teaching me how), and tried to squeeze the marker to thin out the tip and make sure the numbers were readable at the small size they are. They came out good, and of course, it has inspired an internal struggle in my head as to whether I can open up the Etsy shop again and perhaps just offer this design to make things less complicated than the first time around, because I know that I've nailed it.